We are in the thick of prepping Alpha 2 for it’s upcoming release. 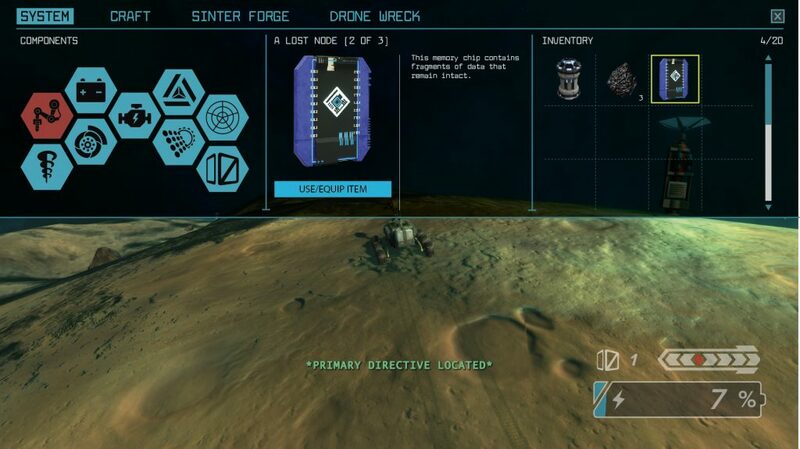 If you’ve been following us, you know the biggest “new” addition coming to Alpha 2 is the lore item system. This game mechanic is fairly simple… we’ve hidden two series of short narrative character stories in a few data chips scattered around the asteroid and you get to go find them and see what they say. Good news! This system is already complete and released in a preview build for backers, Alpha 1.5.1 (featuring gibberish lore text until Alpha 2 is ready)! So, what else are we working on for Alpha 2? I’m so glad you asked! Right now we are finishing up some changes that affect how Tier 1 parts work in the game. We originally ONLY had Tier 1 parts in the game, so we gave them infinite durability. And, since they never wore out, you didn’t need to craft Tier 1 parts, and so that was never an option. Then we started building upgrade paths for each part in the game… so you progress from Tier 1 to Tier 2 all the way up to Tier 4. These upgraded Tier parts have durability, and when they durability wore out, we simply made them “break” and revert back to the default Tier 1 part. That works for development – your part breaks and you experience a reduction in efficiency, but it doesn’t really make sense from a gameplay perspective. Now each item will have it’s own broken status. If you have a Tier 3 drill and it breaks, it won’t revert back to a Tier 1 drill, it will just perform really badly as a broken Tier 3 drill. That means we don’t need Tier 1 to act as a default part, so it can be a complete Tier that behaves as any other. That means Tier 1 parts now have durability, have their own broken status, and be crafted and replaced! Another big Alpha 2 goal is completely replacing the user interface (UI) with something that is both functionally and aesthetically… well, better. The design for the new UI is complete, but we still need to implement this into the game. Our new UI has better organization and access to crafting menus, and will feature a lot of tooltips and alerts to help keep players aware of things like broken parts, inventory limits, or insufficient resources for crafting. We also have a few stretch goals for Alpha 2. These are last on our list (because they may not make it into the Alpha 2 build), but they are really exciting (at least for us). These stretch goals include incorporating cinemachine into our project, which is an animation tool that will help us create some fun intro animations for the demo. We also would love to get a sample of visible part upgrades in the game. Right now, when you upgrade a part on your rover, you don’t see any visual change. You get stat upgrades, sure, but your rover looks unchanged. Of course, in the long run, we want you to be able to swap parts on and off and have the experience of seeing your rover upgrade visually over time. We’re hoping we can demonstrate this with one or two parts in Alpha 2. And, in the future, we hope to offer a lot more customization options for you. Finally, and saving the best for last, we’re currently working with 3D artist Sasha Nodia to reimagine the asteroid world our rover inhabits. We’ve gotten pretty far with our rocky little placeholder, but we really want to create a setting that captures your imagination and wonder. This means we want to create a “game” asteroid, that is more stylized and fun. Something that encourages you to drive around and explore. 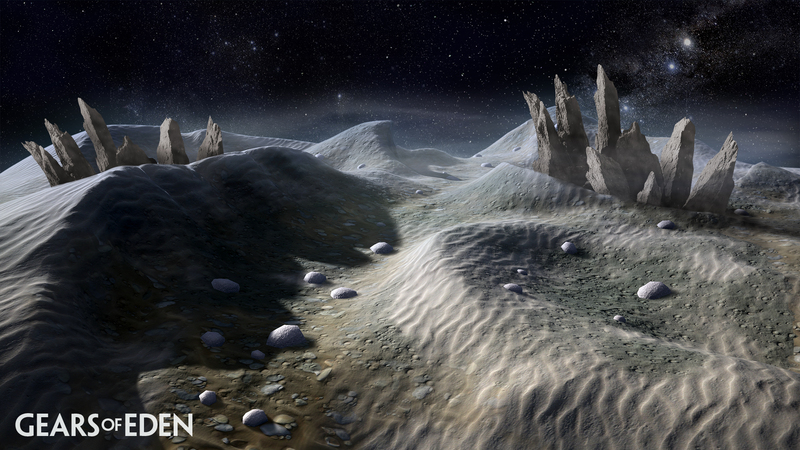 An asteroid that uses different textures, colors, and that has distinct visual areas you can visit and experience. The image at the beginning of this post is just an early sample as we work through the concept process for this new asteroid, but we’re already really excited at where we are heading, and hope to include this new environment as part of our Alpha 2 release! That’s it for this update! Please be sure to follow us on Twitter and Facebook for more! As always, you can see Gears in action through our live development streams on Twitch. And be sure to catch the latest episode of our Podcast, Reaching Eden! Finally, if you’re interested in testing Alpha 1.5.1 or Alpha 2, please be sure to enroll on our website.